North Berwick Law is a small hill with a big view. It’s a lovely short hike that all the family can enjoy. On Wednesday the weather man got it wrong. Not one of those spectacular wrongs where he promises sunshine and along comes a hail storm to strip the skin off your face, or a hurricane to blow your roof off, but he was pretty confident of rain and our plans for a fun afternoon outdoors with the Wee White Dug looked set to be doomed. Lunch was at a dug friendly favourite of ours, The Clubhouse in Gullane. The food is always excellent and the service friendly. Gullane was somewhere we only ever passed through before the wee dug came along and forced us to look for places we could not only walk him but also eat out with him in tow. Gullane has a lovely beach of its own but I wasn’t in the mood for that beach on this day. After lunch, en route to Seacliff beach I was distracted by North Berwick Law. Law is a Lowland Scots word for hill. North Berwick Law is a prominent feature in East Lothian. It rises a mere 187 metres above sea level but as the land there is so flat it can be seen from miles around. It looms like a big rocky cone from behind the seaside town of North Berwick. Right there on a whim my plans to visit Seacliff Beach were abandoned in favour of climbing the law for some views on that still rain free afternoon. It was even starting to look like a really nice day. The bottom of the law was covered in gorse bushes in full bloom. The smell of coconut and the gorgeous yellow flowers made it feel like summer. For those of you unfamiliar with gorse it’s a tough, jaggy bush, not very pretty to look at and best avoided until it blooms. When it does, normally around early May in Scotland, it produces a riot of bright yellow flowers which are scented like coconut. Initially Mr G hadn’t been enthused by the sudden change of plans but as the view opened up quickly below us and the sun started to shine a little brighter he warmed to the law. I’d forgotten to give him the full lowdown on the walk before we set off, so to say he was shocked to be greeted by Exmoor Ponies as we neared the summit would be an understatement. When he spotted them perched atop the craggy rocks he was almost lost for words. Horses up a hill? In North Berwick? Surely not? What’s going on? Like me though he’s a talker and rarely remains speechless for long. Mr G also loves snapping photos from our trips so off he crept like David Attenborough in the Amazonian Rainforest for a shot of the ponies. Gone are the days when he used to roll his eyes impatiently as I stopped frequently for photos. Now we bicker about who’s just walked into the other’s shot. These blog photos are all iPhone 6s snaps as I didn’t plan on taking any photos on a rainy beach that afternoon. The Wee White Dug observed the ponies curiously from afar. They didn’t bat as much as an eyelid at him. I’d love to know what goes on inside his little noodle brain as he meets the various creatures we come across on our travels around Scotland. There are seven ponies living on the law. They were put there several years ago to control the course grass growing on the hill. They’re beautiful beasts and really enhance what’s already a lovely walk. It does look odd seeing them up there though. In Scotland we’re more accustomed to meeting sheep, mountain hares and wild goats on hills. The law is an easy and quick walk up a fairly decent path. The top is a little rocky but nothing challenging. Casper blazed us a trail right to the summit. He loves hills and is really sure-footed. He’ll always find the best and quickest route up. The views from the top are beautiful. A 360 degree panorama of East Lothian, the Forth looking over to Fife and back towards Edinburgh. Unlike Arthur’s Seat in Edinburgh the hill was extremely quiet. We got the summit all to ourselves. Yay – no airbrushing unwanted peeps out of photos or muttering curses under my breath. North Berwick Law – the history bit! Once home to an Iron Age hill fort the summit now has a couple of far more modern historic buildings on it. One is a picturesque ruined lookout post and remnant of the Napoleonic War era. The other is a WWII pillbox. Having such a clear view of the waters below made North Berwick Law a perfect lookout point during times of war. We snapped away at the summit, enjoying the sunshine and the stunning views. The wee dug had a well-earned rest and drink of water. I knew Mr G hadn’t seen ‘it’ yet as he hadn’t shouted the anticipated “LOOK”. In fact he seemed to be in danger of missing ‘it’ entirely. ‘It’ being the money shot and our favourite motto. We alway try to get something out of each day. Even if it’s enjoying a cheap lunch together in a nice little cafe or a walk in the park. Something simple that makes you smile and leaves an imprint on the memory. Life’s short. Sometimes far shorter than you expect. If you’re wondering what the weird white object is behind the trig point and Wee White Dug it’s a fibreglass replica of a whale’s jawbone. A whale’s jawbone has topped the hill since 1709. The last one collapsed in 2005 leaving the hill without its famous landmark. In 2008 this replica was installed after being donated by a mystery benefactor. After soaking up the sunshine and summit views we headed back down to the town of North Berwick for a walk along the beach and around the harbour area. It’s a lovely seaside town and was a childhood favourite of mine. It once boasted an open air swimming pool and was a popular holiday destination. Those days are now long gone but the town is thriving and remains popular. The harbour area where the pool once stood has been regenerated and now houses the Scottish Seabird Centre. There are some great statues on the Seabird Centre site. My favourite is the bird spotter below who can be found peering through binoculars to the Bass Rock on the horizon. The Bass Rock is home to more than 150,000 Gannets so you really don’t want to know why it’s that lovely white colour. Although the open air swimming pool is now long gone, memories of it linger on. One look at those brightly painted old changing room doors and I was transported back to the long, sunny summer days of my childhood. Sandy sandwiches on the beach. Getting a new bucket & spade and mulling over which colour to choose. Birly windmills that made you light-headed when you blew on them too much. Bright pink sticks of mint rock with writing inside. Fluffy, billowing candy floss (which I was frightened of). The merry-go-round with its assorted vehicles (upstairs on the bus was my most coveted seat – I was a weird child). Shivering in an open air pool or the sea but pretending to be warm so you didn’t have to get out of the water. Ahhh, the 1970s – happy days. Mr G loves to tease me about our 9 year age gap but he doesn’t know what he missed scraping in at the tail end of the 70s in 1979. I’m glad I remember most of that tacky, carefree decade of bad taste and UK beach holidays. As you’ll see from the blue skies in the photos sometimes it pays to ignore the weatherman. It also pays to abandon plans on a whim and just head wherever the mood takes you. Previous Start spreading the news……. 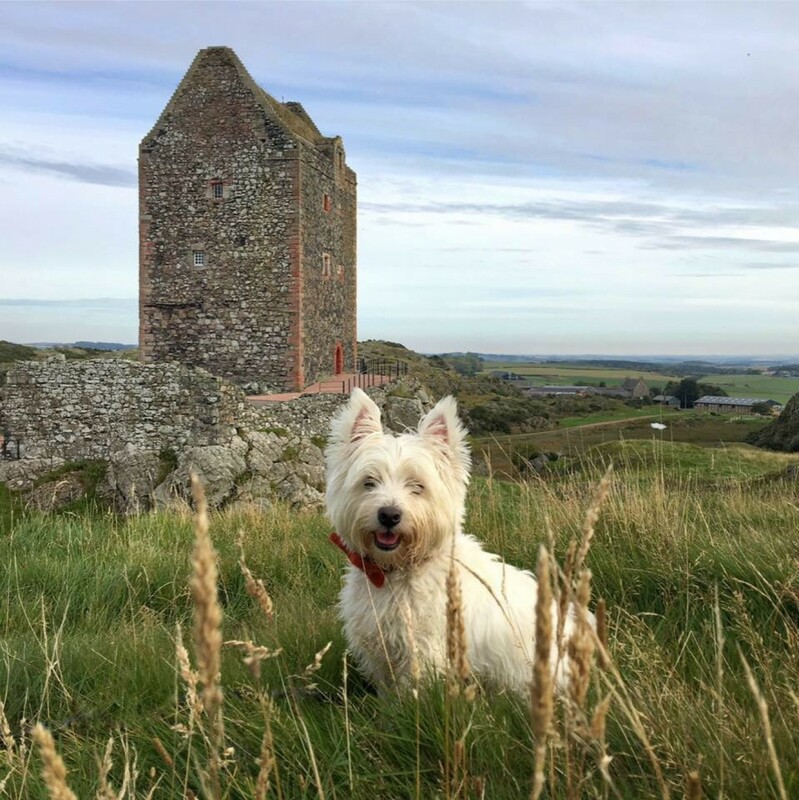 Wow, Sam such adventures with your wee white dug and breathtakingly beautiful pictures along with your documentation I so enjoy EVERY post Thank you from the westielover in the U.S. Thank you Sam for always sharing your photos and amzing stories with us. Are you coming to Italy this summer? Ciao!!! Brilliant! Amazing post and photos! Thank you so much for sharing this. Indeed, “Live for the Moment”! Love the ponies and am so surprised that animals eat gorse! Personally, I love it…from a safe distance! Thanks for bringing back happy memories of time spent in Gullane. It’s a lovely town. We do love East Lothian. I’m afraid you’ll run out of Scottish destinations before I tire of hearing about them! Wonderful post! Love the humor of the wee dug getting ready to take on the ponies! Great blog, that I will enjoy following!! Thank you so much for reading and for your kind comment. We look forward to sharing in your adventures too. Lovely post, I’ve been round these parts and your photos capture the local scenery so well. Thank you, so glad you enjoyed it. We love East Lothian. As you know from your visit it’s a beautiful part of Scotland. Please keep posting! Please! Please!